Republican presidential candidate Mitt Romney reportedly encouraged Florida’s Gov. 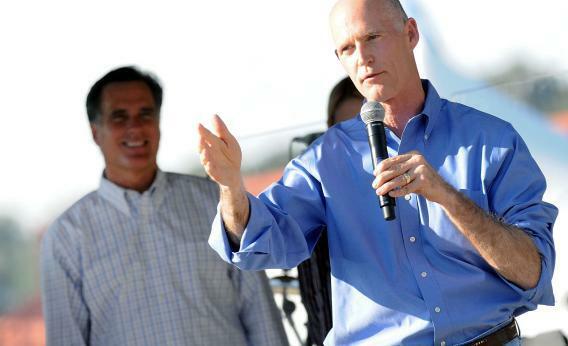 Rick Scott to downplay positive news on the economy, because it didn’t fit with Romney’s messaging on the campaign trail. Presidential hopeful Mitt Romney wants Americans to keep thinking things are really, really bad—and ignore the data that in some swing states, they’re getting better. Bloomberg reports the former Massachusetts governor recently asked Florida Republican Gov. Rick Scott to tone down statements about Florida’s improving unemployment rate, to better fit Romney’s message that President Obama’s policies are hurting the nation’s economy. Gov. Scott isn’t the only one, either. Romney also has the challenge of getting the Republican governors in Ohio, Michigan, Virginia, and Wisconsin to fall in line on his national messaging. And that’s a tall order, considering the leaders in those states need to protect their own political interest by touting economic improvements. With a recent national Quinnipiac poll showing the president edging out Romney 46 to 42 percent, Romney has his work cut out for him. But so does Obama: Spinning bad economic numbers into good ones is harder than spinning good ones into bad.